Verifying email is an important process when you are doing email campaigns. It ensures that your list is clean from invalid emails so you can successfully launch a campaign for your services. Email campaigns are widely used and preferred by marketers compared to other form of media promotion. You can put a lot of details in an email and even include a couple of photos where it’s hard to do so in social media. Also, you can’t always know if your posts do reach your audience. Email marketing is effective since most people will check their emails any time of the day and with smart phones and tablets, checking emails are a lot easier. You can instantly connect with your audience and even offer different products or multiple services to them. You can also use it to inform whether you have a new blog post, review or article on your website. There are a lot of online services that offer email verify service. This comes in the form of a software that will sift through your list of emails so that they can inform you which emails are invalid or have errors so you can remove them from the list. You can then start sending out your newsletters, campaigns, etc. 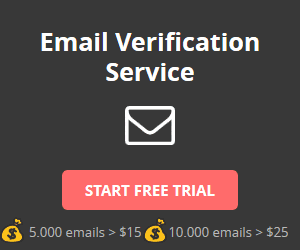 Find an email verify service that can accommodate your number of emails especially if you have over a thousand mails in your list. Sifting through this emails one by one or manually is a very tedious process and it’s a waste of time since you will not be able thoroughly go through them. As opposed to using a software where all you need to do is upload the list and run the program. In just a matter of minutes you will have a clean list and you can start your email marketing campaigns without a cinch.